It’s hot outside and you go to turn on your home’s air conditioner so you and your family can stay nice and cool. Wait, what’s that? It’s not working. Your air conditioner is failing and your air conditioner doesn’t turn on. Now you’re stuck in a hot, uncomfortable house. Why isn’t your air conditioner turning on? It could be due to any number of reasons. 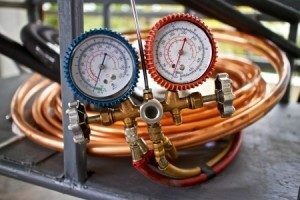 One possible cause is that your air conditioner is leaking refrigerant. If you have a leak, it will cause your system to be put under major stress. Additionally, leaking refrigerant into the environment is never a good thing. If you suspect a leak, contact an experienced air conditioning technician to take a look. Another possible reason your AC isn’t turning on is that your system is old or it hasn’t been maintained properly. Air conditioner maintenance is so important to keeping your system working the way it should. Of course, it’s also possible that your thermostat simply has failed and needs to be replaced. Whatever the cause, your best bet is to contact an experienced AC technician to inspect your system so you can get it fixed as quickly as possible. Let the Denver air conditioning experts at Sanders & Johnson handle all of your home air conditioning needs. Learn more at www.SandersandJohnson.com.